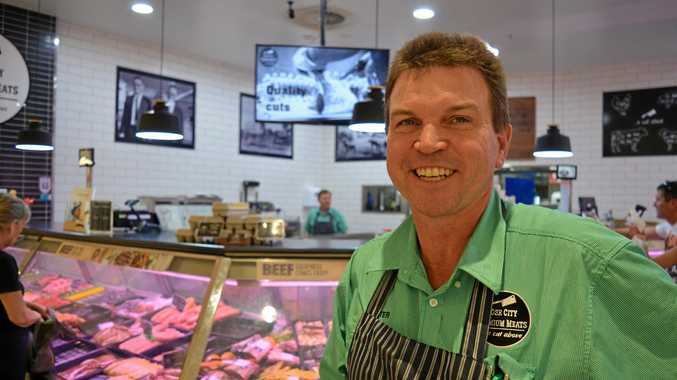 HE'S a lifelong tinkerer, a small business owner and he may have just made the humble axe redundant. Thomas Matyas' piece of ingenuity in the backyard of his Yandina home is the latest in a series of inventions he's made over the years. The owner of AAA Rubbish Removal sells firewood on the side for $10 a wheelbarrow. But an elbow injury about six months ago, during which he tore the muscle off the bone, left him struggling to wield a hand-held wood splitter, the act of swinging it down on the wood too difficult. So he designed his own wood splitter, for about $100 with the use of car suspension in the form of a coil spring, some concrete and metal bars welded together. 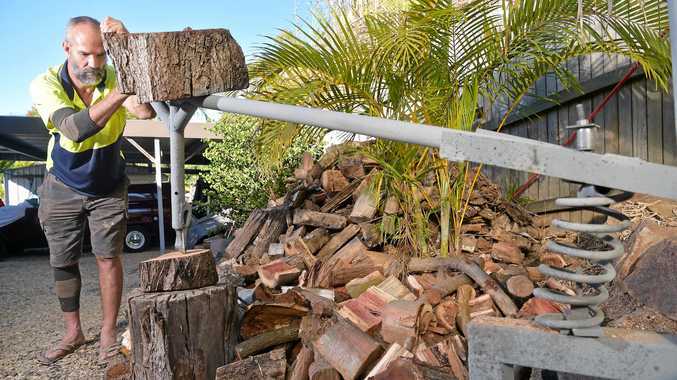 Wood Splitter: Yandina's Thomas Matyas invents a wood splitting machine. The result is a home-made wood splitter which he says can be used with one hand and makes chopping up the firewood a breeze. "I got the elbow injury and started thinking 'how can I improve or find a way to split my wood? '," Mr Matyas said. "It's good for your fitness too." With a log acting as counterweight, Mr Matyas said the invention had worked well, taking the pressure off his elbow, using a different muscle group to split the wood. "It's more shoulder work than arm work," he said. "You can split it with one hand. "There's room for improvement of course." Mr Matyas said the new machine saved costs of individual splitters, which he said were often prone to breaking. "It's easy enough to make," he said. He thought there would be a market for the spring-loaded splitter, as there were probably plenty of people requiring wood cut up who couldn't do it themselves at present. Mr Matyas said the mechanical splitter could take a few attempts to break the wood, depending on the cut of wood, but that wasn't unusual when it came to preparing firewood. "Normal splitters never split wood on the first go," he said. The home inventor said he had no plans at this stage to patent the design, but said it wouldn't take much to make a more sleek model with a little financial backing. "I just like to build things," he said. Some of his previous inventions are testament to that. He said a number of years ago he designed a bike that when pedalled for about half an hour, could power house lights. He's also made a 'giant', 4.5m-high swing set for his daughter.